Published: Monday, March 1, 2010 at 1:00 a.m.
Last Modified: Sunday, February 28, 2010 at 11:16 p.m.
ANNA MARIA ISLAND – Anna Maria Island has carved out a niche for itself as a Florida destination for beach weddings and, in a down economy, the expense saved by getting married outside has been a draw to many couples. 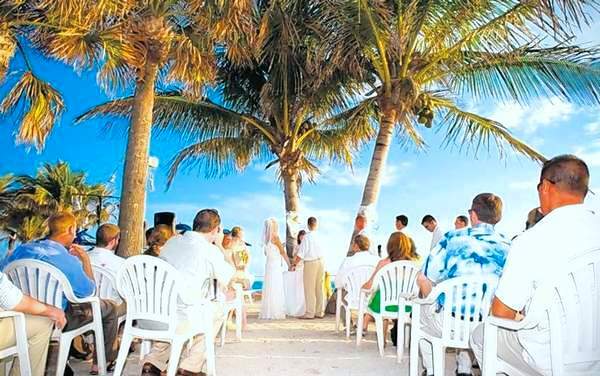 According to Caryn Hodge, coordinator of the Anna Maria Island Wedding Festival, the island sees 1,000 to 1,500 weddings a year. Sunday marked the third wedding festival, drawing an estimated 800 people, mostly brides-to-be and their friends.